Johann Adolf Hasse (1699‑1783) wrote three settings on Pietro Metasasio's much‑used libretto ‑ a text set by Handel in 1728 with Hasse's future wife, Francesca Bordoni, as the opera's leading lady, Emira, Siroe's beloved at Bologna's Teatro Malvizzi in 1733, three years after his appointment as Kapellmeister to the Dresden court of Augustus the Strong, and 30 years later in 1763 as a name‑day ceIebration for the son of the great Elector and subsequent Polish King, Augustus III. For the later production, Hasse supplied his singers with new arias, and judging by the length of the setting by Handel, a ruthless editor of Metastasio's recitatives, he probably made substantial cuts. Decca manages to squeeze three acts on the two generously filled CDs (more than 80 minutes each), which will presumably help sales but gives a false impression of the work's dramatie structure. 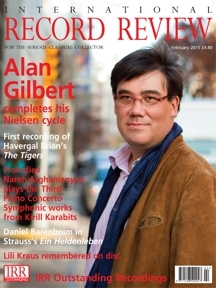 This is the third Baroque opera ‑ the first and second were Handel's Alessandro, an award winner for Decca, and the same composer's Tamerlano on Naïve (reviewed in January and July/August 2013) ‑ masterminded by Max Emanuel Cencic and his Executive Co‑producer, George Lang, using some of the same singers and George Petrou's exceptional period band, Armonia Atenea. It almost goes without saying that a cast headed by Cencic (Siroe), Franco Fagioli (his conniving brother and rival for the throne, Medarse), Mary‑Ellen Nesi (Emira) and Julia Lezhneva (the flighty rival for Siroe's heart, Laodice) offers some of the finest Baroque singing to be heard anywhere today. Handel adapted Siroe to provide parts of equal importance for his rival prima donnas, Faustina and Francesca Cuzzoni, and Cencic and Petrou do the same for Lezhneva here, interpolating a final showpiece from Carl Heinrich Graun's Brittanico so that the 'seconda donna' gets the last 'word'. Like most of Hasse's own arias, Graun's music is virtuoso stuff ‑ often of staggering difficulty ‑ obviously designed to flatter the techniques of singers from the golden age of the castrato and their female colleagues. But a string of brilliant showpieces, linked by very 'dry' Metastasian recits does not a drama make, and there were several moments when I longed for a duet or trio, or a low male voice (the tyrant Cosroe is sung by the remarkable Spanish tenor Juan Sanche, who flaunts stratospheric high notes in his Act 1 aria). The three other male roles are sung by alto falsettists (Cencic, Fagioli) and a female soprano (Lauren Snouffer in the role of Siroe's military friend, Arasse). All sing brilliantly for the most part ‑ Nesi makes heavy weather of Emira's 'Non via piaque, ingiusti dei', but soon unleashes a whirlwind in her tempestuous 'Che furia, che mostro' but the stars here are Cencic and Fagioli, both unmistakeable in timbre and equal to anything Hasse throws at them, and Sanche. Lezhneva is a rising star of the recording studio, and I know her instrumental singing and brilliant coloratura and trills will delight manv, but I wish she would sing words more expressively. As yet, her singing is a nightingale experience, little more. And that's the problern with Hasse. All of his arias are expertly crafted and his knowledge of singers' techniques were probably second to none in his days, but, unlike Handel's, or even Vivaldi's from an older generation, almost none of his solos, has the quality to hit you in the solar plexus. My ears pricked up during Siroe's accompagnato, 'Son stanco, ingiusti Numi' ('l am weary, unjust Gods'), only to discover that it has been filched from Handel's Siroe and is used to preface an aria from Hasse's Tito Vespasiano. This kind of procedure was common in Hasse's ‑ and Handel's ‑ day so it's not a cardinal sin, but I can't help feeling that a 'highlights' disc, or a selection of the best of Hasse from his 70 or so operas might have been preferable to a complete opera. 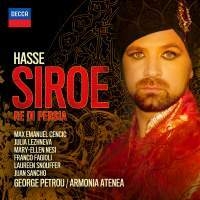 Although this studio recording derives from a staged production, I can't honestly see Hasse's Siroe rejoining the modern repertoire, but it was enjoyable to hear it once performed by such accomplished musicians.